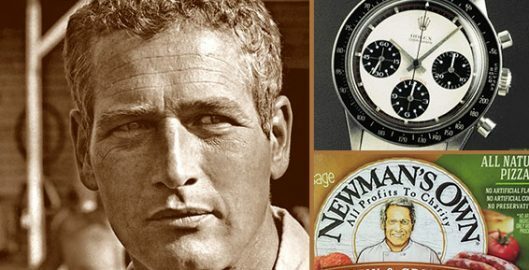 The news about this record-breaking sale occupied all headlines and revived the story of the late Paul Newman, the epitome of cool. Women remember Paul Leonard Newman (1925-2008) as a movie legend and Academy Award winner with the most striking blue eyes in film history. Men recall him as a race car driver, film director, and producer. While the heartthrob’s movie career spanned the 1950s through the 1980s, his entrepreneurial career began in 1982 when he founded Newman’s Own and started his path to personal branding. Newman’s obsession with salad dressing was well known. When at a restaurant he used to ask for specific quality ingredients and prepare his own dressing on the spot. In 1982 he and his friend, author A.E. Hotchner, decided to prepare and bottle his homemade salad dressing as a holiday gift for neighbours. It was an overnight success, which led them to commercialize it for sale. With time, the range of salad dressings grew and new products were introduced. 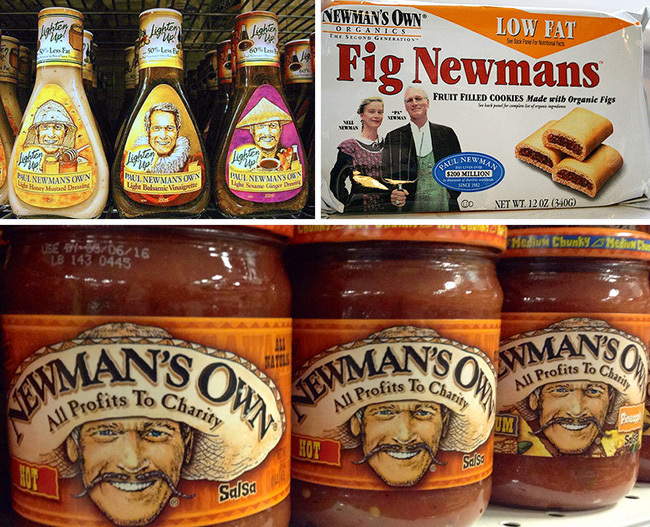 Pasta sauce (1983), salsa (1991), lemonade (2004), popcorn, tea, cookies, frozen pizza, frozen skillet meals, and wine (2011) – all products feature a photograph or illustration of Paul Newman on the label (usually wearing different costumes according to the product) following best personal branding tradition. In 1993 Nell Newman (Newman’s daughter) founded Newman’s Own Organics as a division of the company, using only organic ingredients for the line. What started with organic pretzels became a diversified line of pasta sauces, chocolate, cookies, dried fruit, olive oil/vinegar, coffee, tea, and pet food. The labels for the organic line followed the best self-branding tradition, depicting Nell and her father, Paul Newman, on the packaging. Authenticity is key for successful personal branding. When shoppers screen a store shelf the association is immediate. As a popular movie star who led a solid family life (married to Joanne Woodward for 50 years), the sympathy is immediate as well. Newman chose to launch his career as an entrepreneur in a field close to his heart, and for which he had a real affinity. He chose to craft the development of his personal story in a way that will tie it to the destiny of many others and to state it on the packaging. Since the company’s inception in 1982 and to this day, all proceeds of Newman’s Own (after deduction of operation costs and taxes) are distributed to a number of tax-deductible charities and causes. Personal branding is not a novelty. Many celebrities excel at self-marketing and building an entire industry around their persona, or choose to lend their name to a range of products (fashion, cosmetics, restaurants to name a few). However, not many are so personally involved with sourcing and product development and even less give all their profits to charitable causes. Newman’s military service during World War II helped shape his appreciation of luck. He was grateful for his good fortune and was determined to help others. In 1999 the Newman’s Own Awards were established to recognize organizations with inspiring initiatives to help improve quality of life for military service members and their families. When personal branding = $495+ million in charitable donations. Furthermore, the actor used his name to directly support children with life-limiting conditions through the establishment of The Hole in the Wall Gang Camp (1988). This initiative evolved into a global network of camps, which have served over 384,700 kids worldwide since 1988. In 2012 all camps were united and re-branded under the SeriousFun Children’s Network. In 2005 Newman’s Own Foundation was established to ensure the continuation of the distribution of Newman’s Own profits to charities after Newman’s death. What started with a homemade salad dressing wrapped in a Paul Newman label, grew into a large employer which, according to the Newman’s Own foundation, has donated over $495 million to various charities worldwide since 1982. The man with the chiselled features and piercing blue eyes took personal branding to a whole other level.